The Victorians were fond of making the ordinary appear extraordinary, especially when the extraordinary exceeded one’s reach. Faux finishes are not limited to late 1980s interior decor or to low budget “trading rooms” television programming. The Victorians were fond of making the ordinary appear extraordinary, especially when the extraordinary exceeded one’s reach. I found some original Victorian wood graining under layers of paint that easily peeled off. The art of trompe l’oeil, “to trick the eye”, used an elaborate painting technique to simulate quality hard wood grain on softwood or marble on plaster. More elaborate applications would apply decorative frieze or even painted simulated scarves over doors or birds on ceilings (Guild, 2008). As I expected, there is very little new in post-modern aesthetics… Apparently, trompe l’oeil applications were most popular near the lat 19th c. and used in small and grand houses alike. Skilled artists gained prominence and were sought after for their work in the best homes. The oak appearing on my door would have first been painted with a deep beige base colour that would then have been glazed with burnt umber and ocher to give it light and dark highlights. The artist would then pull a multi-toothed brush through the glaze to produce the grain by revealing the base coat, then finish by flogging with the brush to break up some lines (Guild, 2008). Many homes will still have these finishes preserved under layers of paint. These finishes can actually be restored by using solvents to rub down to the trompe l’oeil finish that is protected by glaze (Nigel, 1997). Paint stripping will destroy these original features. Leaving the finish under paint is an accepted preservationist approach. Guild, R. (2008). The Victorian House Book: A Practical Guide to Home Repair and Decorating. Firefly Books. I caught a bit of luck in that the POs (Previous Owners) did not remove the antique pine front door and replace it with a Big Box pre-hung door. Of course the door was layered in paint and the original antique mortise lock was replaced with a typical off-the shelf lock for a bored-door. 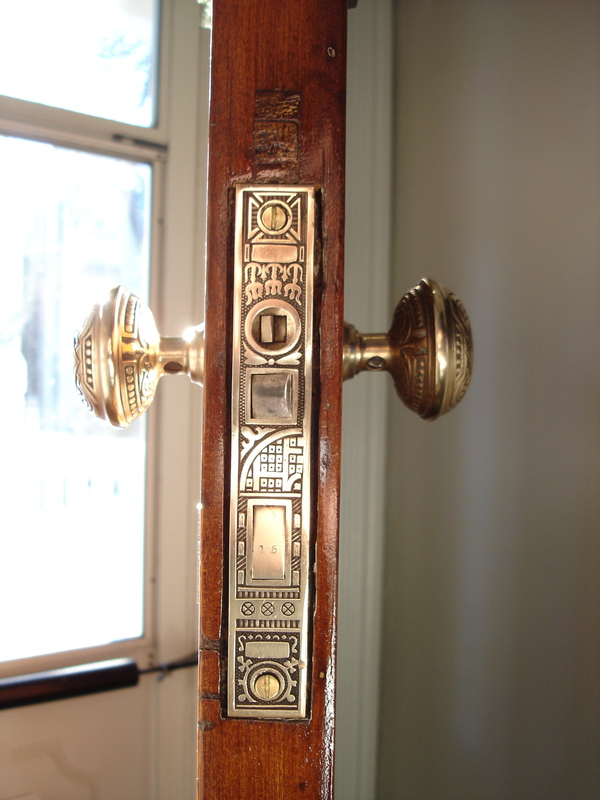 This is the modern way in which locks are fitted to doors, while antique houses would largely have had their doors fitted with mortise or rim locks. While the new lock was not completely unattractive (relatively speaking I suppose), it unfortunately meant that one of the POs bored a hole in the door, right through the mortise so that a modern lock could be installed. This meant that a antique mortise lock could not just be fitted into the door without repairing the hole that was made for the lock. Minor headaches, but not an impossible fix. the plug to restore the space for the mortise. The inner workings of the lock are fascinating and it still has a solid and clean working mechanism. The reason for all this was because I love house hardware and really wanted to make use of the antique bronze Eastlake styled mortise lock I picked up. 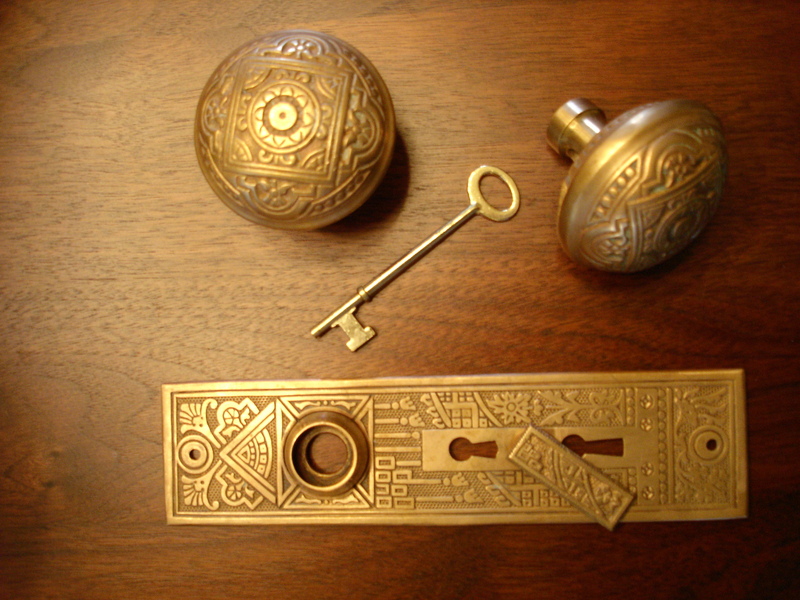 It is a great piece of hardware made by Corbin in 1878 and matches some existing Eastlake hardware within the home. Corbin apparently still manufactures door “furniture” (a UK and rarer Canadian usage) or hardware at a factory in Berlin Connecticut. The company started off as Corbin Russwin in 1839 manufacturing plate locks. The escutcheon plate has a swing key hole cover that is meant to prevent outside drafts. 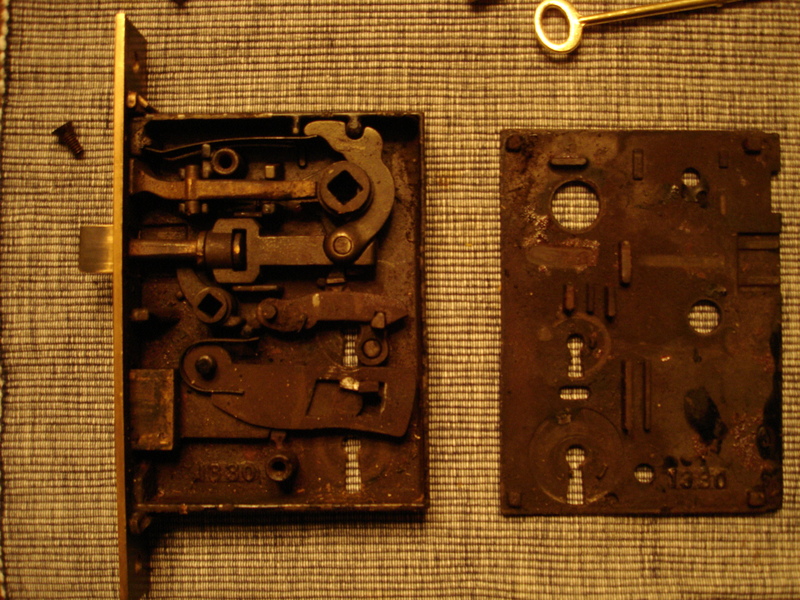 The inner workings of the lock are fascinating and it still has a solid and clean working mechanism. Of course, a deadbolt should be used for real “security”. Luckily, the mortise lock’s face plate fit my mortise well. It is important to get the “back-space”, that is the distance from your door’s edge to the centre of the door knob accurate if you are fitting a lock into an existing mortise. Since the door was bored, I could re-drill the appropriate length backspace into the new wood plug, meaning I did not have to endlessly search for the perfect mortise lock with the right backspace for my door. After fiddling with repairing the door, it was simple to install the mortise lock, the escutcheon plate, attaching the door knobs to the spindle, securing the set screws on the spindle and enjoying a moment of amazement that a downtown Toronto dude once living in a concrete box on the 22nd floor of “apartmentopia” could somehow pull it off! Houses are fun that way. It was amazing how easy it was once the door was repaired. It just worked the way it was intended to. No headaches trying to force new hardware or materials that were not intended to be a part of an old house.